Now that Ford has decided to kill off its entire lineup of cars in the United States, aside from the Ford Mustang, of course, the Focus ST is destined to become to enthusiasts what the Honda Civic Type R once was – a car that fills our every desire but is somehow just out of reach. It’s more powerful brethren, the Focus RS, will also suffer the same fate, never landing on U.S. shores again, but for now, the new ST has been announced, and it already has fanboys up in arms. 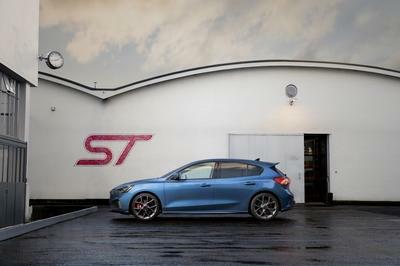 It’s not surprising really since the new ST comes complete with a 2.3-liter EcoBoost that’s good for 276 horsepower and 310 pound-feet of torque – 24 ponies and 40 pound-feet more than the last model we were lucky enough to see. And, it comes with a striking new look and the reminder that the next-gen Focus RS will be that much better too. We know you’re sad that you can’t get your hands on the new ST, so we’ve decided to make it our wallpaper of the day. At the very least, you can plaster it on your desktop and show it some love from afar.